MARCO MELANDRI AND SYLVAIN GUINTOLI ARE READY TO INCITE THE ITALIAN FANS. Noale, 7 May 2013 – The first Italian round of the 2014 World Superbike Championship season is coming up. The factory derivative bikes are getting ready to take on the Imola track, the historic circuit on the banks of the Santerno which has always stirred up the hearts of fans. Its nature as an “old school” track, despite the changes that have been made over recent years, always makes it a particularly demanding circuit for bikes and riders and, consequently, for any gearhead. For Marco Melandri motivation abounds. After the demanding weekend at Assen the rider from Ravenna is keen to improve his synergy with to find the consistency and speed he’ll need to aim for the title. Imola is definitely not an easy track. Experience and focus are required to turn up at the races Sunday in the best possible conditions and Marco has plenty of both. 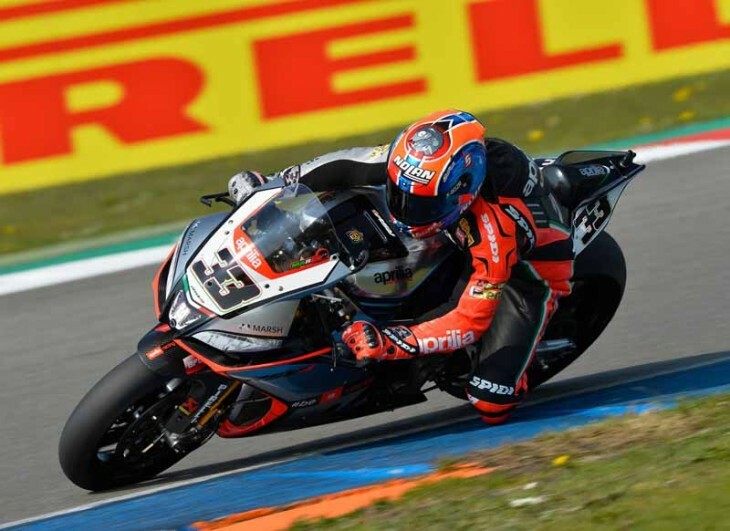 A key player in Holland, where he took a win and just barely missed making it a double, Sylvain Guintoli will take on the Italian round with an eye to confirming his progress. He now lies in second place in the rider standings, just 12 points behind Sykes in the lead, a truly slim gap considering the fact that this is only the fourth round of the season. The podium he took here in 2013 during his rookie year on the Aprilia RSV4 is a nice calling card for the French rider who has recovered from the blow he suffered during Race 2 at Assen. Sylvain Guintoli: “In Assen we made big progress with the RSV4 and we showed our fighting spirit, it paid off with the win in race1. I want to continue in this way in Imola. Although my back was really painful after the crash in race2, I am now back to full fitness and ready to fight for the win”.